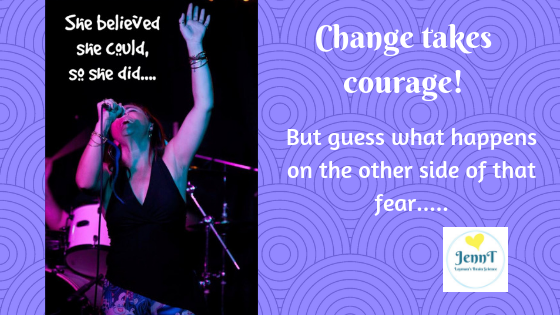 Change does take courage…. BUT guess what happens on the other side of that fear?!? So let’s rewind the clock a few years… I felt like something was missing in my life, like I was a hamster stuck on a wheel going round & round. I knew there must be more to life than this…..
Also had a secret dream that had been bubbling away inside me that I was too embarrassed to tell anyone about. Since I was about 12, I wanted to be a singer, on stage in front of an audience. The audience didn’t have to be huge…. just in a pub would do me…. – other people’s reactions were interesting to observe….